ough not a household name in the United States, professional motorcycle racer Marco Simoncelli has long been celebrated in the racing world for his success in the Road Racing World Championship. The Italian-born Simoncelli worked his way up through the various classes and won the 250cc World Championship in 2008. In 2010, he made his way to the top-tier MotoGP World Championship and was primed for big things. Tragedy struck on October 23rd, 2011 when Simoncelli was killed in a collision at the Malaysian Grand Prix. Since then, an outpouring of support has appeared for Simoncelli and collectors have rushed to get memorabilia to remember the talented racer. Several of his signed helmets were going for thousands of dollars in the days and weeks after the horrific accident. Most of the items available are multi-signed items that feature several racers on the same piece of memorabilia. Be careful when reviewing Simoncelli autographs as eBay is flooded with reprints (often listed as "RP") that can have deceptive titles and descriptions. 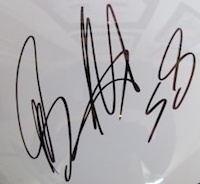 Below you will find an example of what Marco Simoncelli's authentic signature looks like. This can be used as a first point of reference for determining the legitimacy of autograph memorabilia, but is not a substitute for having your items authenticated by a well-respected professional autograph authentication company.